Promachoteuthis sloani is known from two specimens: the smaller holotype, an immature female 58 mm ML and a paratype, an immature female, 102 mm ML. The paratype was captured by the R/V WALTER HERWIG in 1973 while the holotype was captured by the R/V G.O. SARS in 2004 and was in near-perfect condition. Both were taken from the North Atlantic in nets that fished to depths greater than 2,000 m. Virtually nothing is known of their biology. with mostly 3-4 series of suckers on arms. Arms with three or four rather irregular suckers series in mid-region sometimes appearing as up to six series. Figure. Oral view of the midregion of a lateral arm of P. sloani, holotype, preserved. 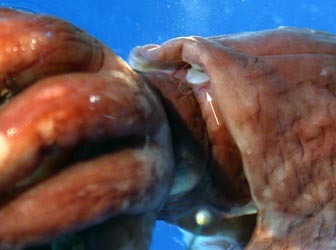 Tentacles thick at base (slightly thicker than adjacent arms); club not flattened; club) about 60% of tentacle length. 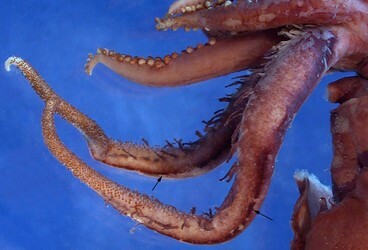 Each tentacle with two series of long papillae near oral midline at tentacle base but diverging to be lateral to club; papillae often with stubby branches in holotype but become flattened, highly branching or merge into a complex membrane in the paratype. Darkly pigmented ridges present along the lateral margins of the aboral surface of each tentacle; distally the ridge breaks into small papillae. Pigmented ridges in paratype less prominent and restricted to middle third of tentacle. Head extremely small with very small eyes buldging laterally from reduced head. Eyelid forming a small, circular opening. Eyelid over lens opaque but with, apparently, a somewhat clearer central region. Beaks: Descriptions can be found here in 2D. Figure. Side views of the head of P. sloani, holotype. Left - Preserved squid. Left arrow points to edge of iris; right arrow points to slit which is the collapsed opening of the eyelid. Right - Unpreserved squid. Eyelid opening a small, dark oval pore; iris visible but difficult to discern; whitish, oval ring that passes by the eyeopening appears to define a slightly less opaque (i.e. clearer) region of the eyelid but it is difficult to distinguish in the photograph on the left. Photographs by R. Young. Anterior mantle-margin free from the head. A nuchal cartilage is present. Figure. Anterior dorsolateral view of the mantle opening of P. sloani, holotype, preserved. Arrow points to nuchal cartilage. Photograph by R. Young. Fins large; large anterior lobes present; posterior lobes absent in holotype but small, distinct posterior lobes present in paratype. More information on the description can be found here. Promachoteuthis sloani is very distinctive and easily separated from other members of the genus by the peculiar tentacles among many other features. Type locality - Central North Atlantic at 53°05’N, 36°46’W (R/V G.O.SARS MARECO cruise super station 14, local station 341)in an trawl that fished to a maximum depth of 2792 m in 2004. Paratype came from the Eastern North Atlantic at 46°00'N, 15°49'W (R/V WALTER HERWIG station 714) in a trawl that fished to 2650 m.
Toll, R. B. 1998. 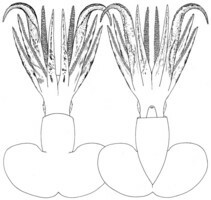 The gladius is teuthoid systematics. Smithson. Contr. Zool., No. 586: 55-68. Young, R. E., M. Vecchione, U. Piatkowski. 2006. Promachoteuthis sloani, a new species of the squid family Promachoteuthidae (Mollusca: Cephalopoda). Proceedings of the Biological Society of Washington, 119 (2): 287-292. Keiko Hiratsuka Moore, National Marine Fisheries Service. Page: Tree of Life Promachoteuthis sloani Young, Vecchione & Piatkowski 2006. Authored by Richard E. Young and Michael Vecchione. The TEXT of this page is licensed under the Creative Commons Attribution-NonCommercial License - Version 3.0. Note that images and other media featured on this page are each governed by their own license, and they may or may not be available for reuse. Click on an image or a media link to access the media data window, which provides the relevant licensing information. For the general terms and conditions of ToL material reuse and redistribution, please see the Tree of Life Copyright Policies.